Both my daughter and I suffer with dry skin all winter long, so we have quite the variety of lotions in our bathroom. Many of the lotions that I have for myself are scented products from places like Bath & Body Works and Victoria’s Secret, but they are really greasy and seem to only offer relief for a few hours before I need to apply it again. For my daughter, though, we have used products from Aveeno, Aquaphor, and Johnson & Johnson’s for her skin problems. 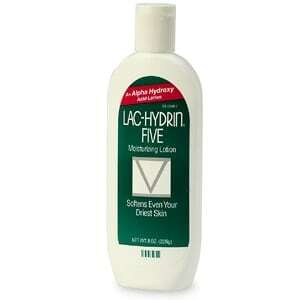 Most recently, I got to try a lotion I’d not heard of before called Lac-Hydrin® 5 Point. The very first thing that I noticed after rubbing it into my daughter’s skin was how non-greasy it is. I love that I don’t have to either wipe my hands off on my jeans or go find a hand towel in the bathroom to wipe off any excess that didn’t work its way into her skin or my skin. Additionally, the Lac-Hydrin® 5 Point lotion kept her skin and mine moisturized and soft for the entire day. I love that I don’t constantly have to reapply it, and that she can go through her day without that interruption anymore. Lac-Hydrin® 5 Point is a lotion that can be used on all members of the family, saving you tons of money for skin care. It is also fragrance free, so you can layer for favorite scented sprays over it and no other smell will mix with that scent. That’s especially good for me because I generally prefer to use a body wash, lotion, and spray/perfume that are all the same scent. Lac-Hydrin® 5 Point lotion can be found on numerous websites online: CVS, Amazon.com, and Drugstore.com, just to name a few. Thank you for this giveaway. As a frequent user of the lotion AmLactin, I am always interested in trying out similar lotions.